A couple of days ago I decided to take a few days off from my router table. The next step was to route out the edge that would hold the Rousseau router plate. Was there fear and trepidation in my little novice woodworker’s heart? There certainly was! I knew that the slightest error in measuring or planning could result in a disaster that would reverberate throughout the greater metropolitan Martelle area. It would likely be worse than the Tunguska Blast of 1908, and could possibly cause pole reversal and ultimately global extinction. So it was natural for me to want to get in the right frame of mind. I went and bought some two sided carpet tape from Ace Hardware in Mt. Vernon. Dave was very helpful. The people at Rousseau were nice enough to include instruction for how I should go about getting the edge routed. I read the instructions, something that I am not proud of, but it seems a necessity in woodworking. Actually it is much worse than that, I also dug out the instructions for my plunge router, and read those too. I have no doubt that I have lost a lot of respect from my male readers. I may not attend the ‘guy’ meetings for a while, just to let things blow over. I was very careful to place marks where the edges of my boards were to rest. I have not used carpet tape before. It is very sticky. I wasn’t sure if some of the adhesive would remain on the wood, and need to be cleaned off, so I chose to clamp the two longer pieces to the top, thus eliminating a good portion of the potential for tape residue. Once the long pieces were in place, I cut a couple of pieces of scrap wood with my Japanese hand saw. I know that I always talk about the Japanese hand saws, but it is because I love them. It seems that with each time I use them, I get a little bit better at making accurate cuts. So the scraps were cut. I stuck them to table top. The scary part was quickly approaching. My instructions told me that I needed to make a cut of 3/16th of an inch. I made the decision to use my plunge router, because of the depth guide, and because I had yet to use it. I zeroed it out. Set it to 3/16th of an inch. The next fifteen minutes were spent checking and double checking the measurements. I did a practice run, without the power on, just to understand how I was going to proceed. Finally there weren’t any more precautions I could think of, so I began. The first lap around the opening was pleasantly easy. I expected it to go horribly wrong, but to my joy and amazement, it went smoothly. I checked the plate and the long cuts were perfect, but the short side was about 1/32nd of an inch too short. Also the depth wasn’t quite as deep as it should be. This was just fine with me, as it is easier to cut more, than to deal with a depth that was too great. It only took me two more laps around and I ended up with a really nice fit. I am thrilled with how it turned out. The plate fits. The next step is to figure out how to attach the router base to the plate. I am far more frightened of this step than the last one. I figured out how to attach the plate to the router base, using the Shop Fox template and the centering cone. But once I get the whole thing on there, I am completely stumped. Should I use some sort of awl to mark where I drill? It doesn’t seem possible to drill the holes with the base attached. Any ideas or advice would be greatly appreciated. Ok, time to get a snack and to go back downstairs and look at my success. You’re making great progress! I am not sure about your question, but I can suggest making a practice part to ensure your mastery of the next step. Hi Brian, you might find the video on setting up a plate on the link below to be of some help. It’s for a Kreg plate, but the principal is the same. where is the link , mike ? Not much help here either. Seems the scratch awl is the way to go to me. Very nice Brian. This is one huge accomplishment with lots of challenges that were faced and met. Good job. 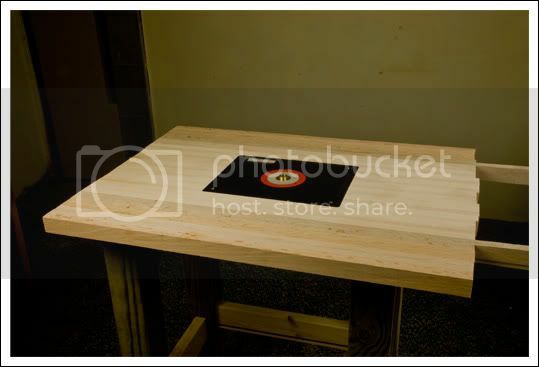 I made my first router table about 10 years ago and my second is in production. I’ll probably cut and route the holes for the insert in the next few days, but there is still trepidation even though I’ve done it before. In my case I’ve laminated the top with microdot formica and I really don’t want to err. I won’t trust the depth gauge on the miter. I’ll use the thickness of the router plate to set the depth and then do some test cuts. I spent 4 years in Grinnell just down the road, go Pioneers. Nice job on the insert Brian. I will be feeling your pain starting next weekend when I pickup the lumber for my table. I already ordered the insert and the miter/t-tracks. You could try using transfer punches, pretty cheep from Harbor Freight. They are a set of many different sized pinches( one for each drill size) with a little center punch tip on each. When I discovered them I couldn’t figure out how I lived without them for so many years. Don’t hit them very hard on the plate as it may crack. 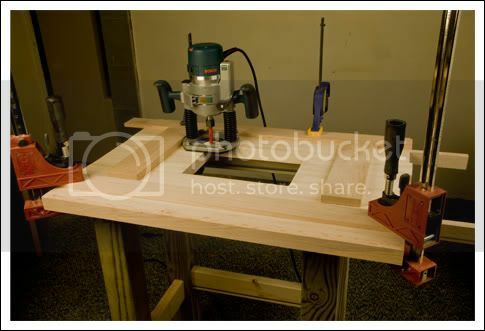 One other suggestion is to photo copy the original router base plate and use that to make you screw hole centers . Steve, I will cut off both ends, to bring my table to 32”. I plan on doing that last, as those bit sticking out have been very hand for clamping. I got the idea to leave the long parts on, from the Sam Maloof video. He did that with some of the more unwieldly parts of his chairs. I decided to give it a try with my table top, when I realized that I had that 6 inches of excess on a couple of the lengths. It has really been helpful.